There can be large spatial and temporal separation of cause and effect in policy making. Determining the correct linkage between policy inputs and outcomes can be highly impractical in the complex environments faced by policy makers. In attempting to see and plan for the probable outcomes, standard linear models often overlook, ignore, or are unable to predict catastrophic events that only seem improbable due to the issue of multiple feedback loops. There are several issues with the makeup and behaviors of complex systems that explain the difficulty many mathematical models (factor analysis/structural equation modeling) have in dealing with non-linear effects in complex systems. 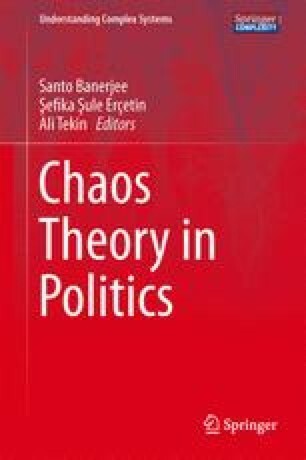 This chapter highlights those problem issues and offers insights to the usefulness of ABM in dealing with non-linear effects in complex policy making environments. Byman, D. L. (2012). Finish him: Why the world needs to take out Bashar al-Assad now. http://www.brookings.edu/opinions/2012/0202_syria_assad_byman.aspx. Accessed 3 Feb 2012. DeCoster, J. (1998). Overview of factor analysis. http://www.stat-help.com/notes.html. Accessed 22 Oct 2011. Ries, C. P. (2011). The year of the Arab Spring. http://www.rand.org/commentary/2011/12/20/GS.html. Accessed 3 Feb 2012. The Economist. (2012, January 28). Leaders. Syria’s uprising: Hold your horses. http://www.economist.com/node/21543542. Accessed 3 Feb 2012. Wilensky, U. (1999). NetLogo. Center for Connected Learning and Computer-Based Modeling, Northwestern University, Evanston, IL. http://ccl.northwestern.edu/netlogo/. Accessed 4 Feb 2011.